Whether you want to improve your speed and power or prevent injury, strength training should be a part of your weekly training regimen. These 10 must-do exercises will get you started. 1. Lying on your stomach, place your elbows under your shoulders with forearms and hands on the floor. 2. Lift your hips off the floor, keeping your back straight and abs tight, and rest on your toes. Aim for two sets of 40 to 60 seconds. 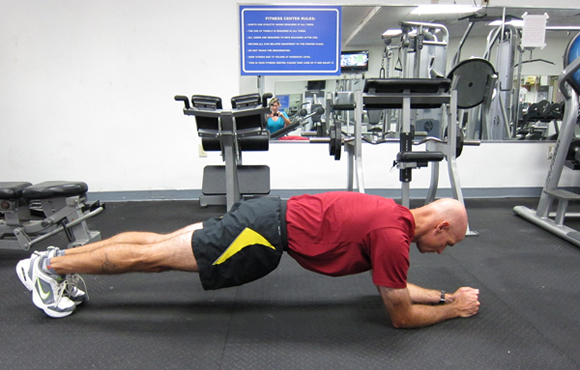 Why It Will Help: The plank builds the strength and muscular endurance you need to ride powerfully in the drops or in an aero position long after others have surrendered to the top of the handlebar. Stand tall holding a barbell across your shoulders. Bend your knees and hips until your thighs are at a 45-degree angle. Return to start. Complete three sets of 10 repetitions. The last few reps on the third set should be difficult to complete. Why It Will Help: Builds strength for climbing and sprinting. 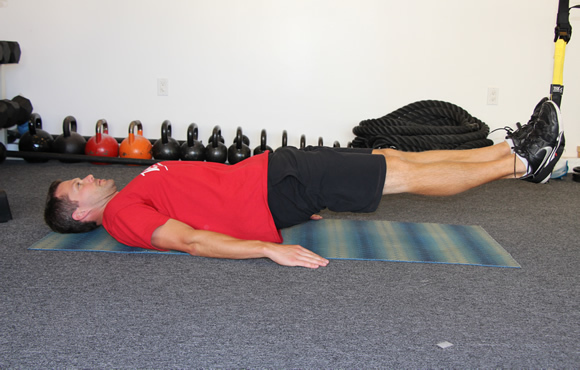 Lie down on the floor with your legs bent as shown and lift one foot off the floor. Lift your hips up in the air, concentrating on contracting your glute muscles (think pushing through your heel). Make sure you keep your toes of the working leg up as shown. Pause for a second or two and lower. Perform 2 to 3 sets of 8 to 12 reps with each side. This exercise can be done anytime, but works particularly well before a strength workout to "wake up" your glutes, especially if you have been sitting for a while. Why It Will Help: Improves strength, speed and endurance on the bike. 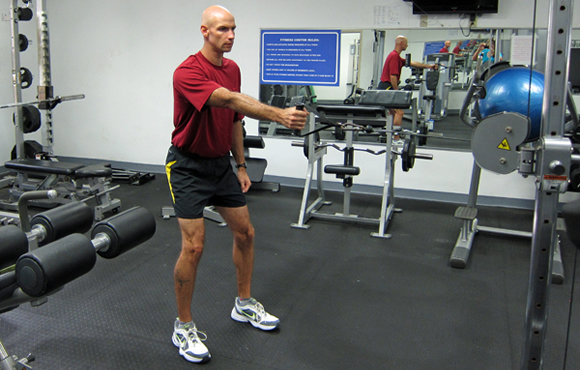 This exercise is good for developing strength in the quadriceps, gluts, deltoids and biceps. These muscles are used when you need to stand and accelerate on the bike. 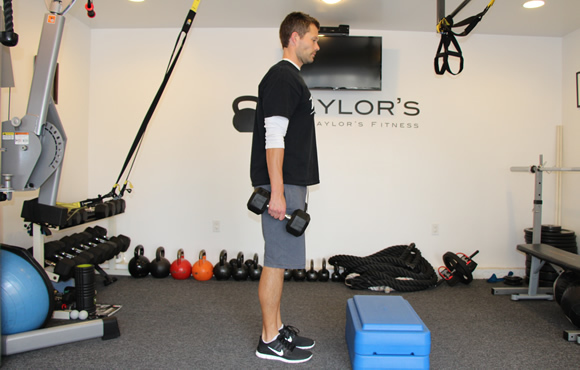 Stand erect with a dumbbell or resistance band in each hand. Step forward with one leg. Keep your back straight and bend your front knee to 90 degrees. The back leg should be straight. While in the lunge position, perform a biceps curl with both arms. Reverse the steps and repeat with the opposite leg forward. Start off with two sets of 10 repetitions on each leg. What It Will Help: These muscles are used when you need to stand and accelerate on the bike. Start in a sitting position with your knees bent in front of you and your feet flat on the ground. In one motion, lift and extend your legs out in front of you and lean your upper body back so that your body forms the shape of a V. Stretch your arms out straight in front of you and tighten the lower abdominal muscles. Keep your shoulders relaxed and your back straight. Hold this position for 10 seconds and repeat 5 to 10 times. Increase duration and reps as needed. Why It Will Help: This exercise will allow you to be more comfortable and experience less pain in aggressive cycling positions. It'll also decrease fatigue by strengthening muscles that improve lower back. Place three cones or water bottles in front of you as shown. Standing on one leg, perform a squat by bending the knee slightly and reach down toward the left cone. Return to a standing position, squat and reach towards the forward cone, then back to a standing position. Finally, squat and reach towards the right cone. Repeat the entire sequence while standing on your other leg. Complete one set of 10 repetitions to start and increase as necessary. Why It Will Help: Hip and core strength will improve your balance on the bike, which is necessary to improve your endurance and bike handling. Stand in front of a cable column with your feet shoulder-width apart and your knees slightly bent. 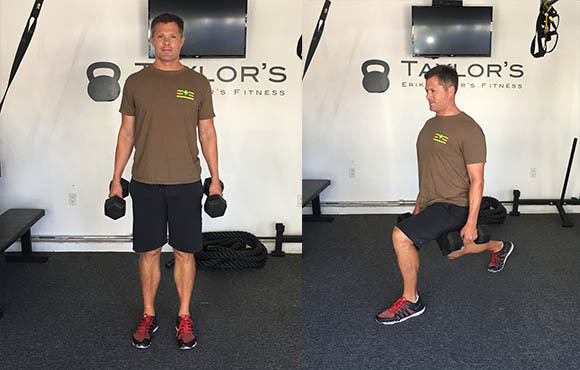 Grab a handle and perform a standing row while keeping your body as still as possible. Avoid the temptation of leaning forward and back to lift more weight. You'll find this exercise works your hips just as much as your upper back muscles. Complete 2 to 3 sets of 10 repetitions. Why It Will Help: The scapular region is a common area of fatigue among road cyclists due to the hunched position on the bike. Strengthening these muscles will prevent injury and help you to ride longer without discomfort. You've probably done step-ups before, but here we're going to make a couple of modifications to make the exercise a little more challenging. First, find a step that's not too high—an aerobic step works really well since you can usually adjust the height. A good starting point is about 6 inches. Hold a pair of dumbbells at shoulder height and place one foot on top of the step. Now, it's important to visualize this leg doing the work as you make your way through the set. Step up and raise your trailing leg as shown. 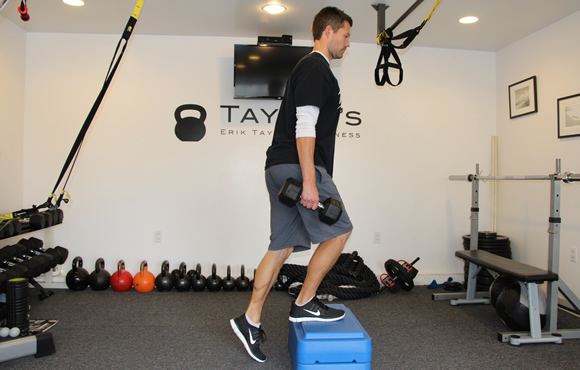 This exercise will challenge your balance quite a bit. Return to the starting position, but don't let your trailing foot touch the floor. Let it hover an inch or so above the floor for a second or two while keeping an upright posture before starting the next repetition. This is going to increase the difficulty of the exercise, as the muscles of your lead leg will be under constant tension. Since your trailing leg doesn't touch the floor, it'll be impossible to push off with that foot. Many people find this version of the step-up quite challenging. If you're having difficulty, reduce the height of the step to around 4 inches and/or start with bodyweight. Complete three sets of 10 repetitions. 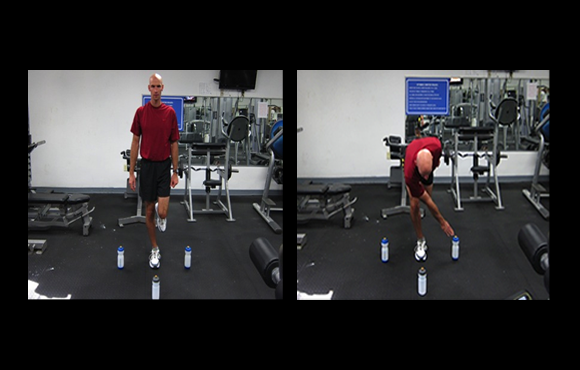 Why It Will Help: Single leg power will help you work on muscular weakness needed to develop an efficient pedal stroke and prevent injuries in the lower extremities. Kneel in front of a cable column as shown. Grasp a traditional pulldown handle with an overhand grip slightly wider than shoulder width. Keep your torso upright and pull the bar down to your collarbone. Slowly return to the starting position and repeat. Complete three sets of 10 repetitions. Tip: Kneeling on the floor forces your core and postural muscles to engage throughout the movement as opposed to a traditional lat pulldown machine, which has locked in a fixed position with little core and postural involvement. What It Will Help: Strengthening these muscles will help to prevent fatigue in the neck, shoulders and back on long rides. Lie on the floor with your heels in the handle cradles. Lift your hips up and curl your heels toward your hips. Try not to let your hips drop as you perform the curl. Complete two sets of 8 to 12 repetitions. Why It Will Help: The hamstrings work with your hips while pedaling. Proper quadriceps- and hamstring-strength ratios are important to avoid lower extremity injuries and improve the upstroke during the pedaling motion.